Turmeric Curcumin Sleep Aid with Melatonin - is currently on backorder. You may still purchase now though and we'll ship as soon as more become available. Our melatonin can support tranquil sleep and the natural sleep/wake cycle. 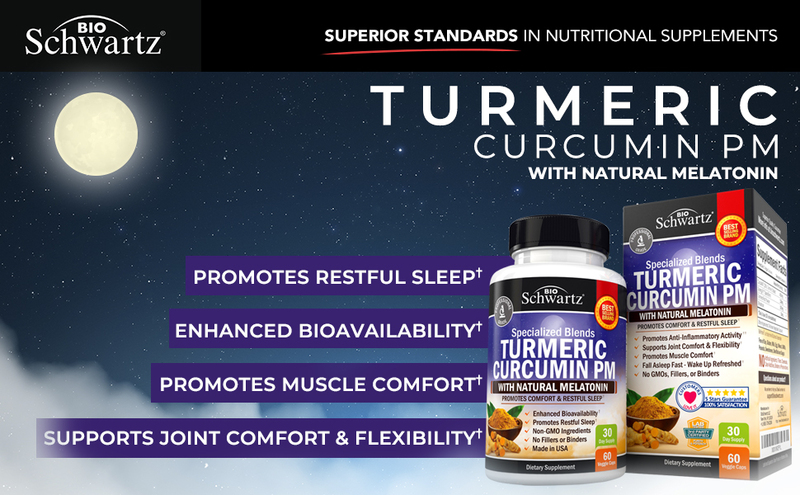 Formulated for nighttime comforts, BioSchwartz Turmeric Curcumin PM with natural Melatonin works as a complement to our top-selling Turmeric Curcumin with the added benefit of sleep support. Valerian Root naturally reduces insomnia and anxiety, while also promoting sleep. It is also known to relieve joint pain and help induce relaxation, reducing the time it takes to fall asleep. L-Theanine, a powerful amino acid included in this supplement, encourages the reduction of anxiety and stress by reducing resting heart rate. Together, these ingredients support higher quality rest, supporting a better you. SUPERIOR ABSORPTION AND 2000% IMPROVED BIOAVAILABILITY. Despite their extraordinary potential, many herbs can have limited benefits due to poor absorption, curcumin included. However, our Turmeric Curcumin PM formula contains CurcuWIN: “the optimal solution to curcumin absorption.” Since curcumin has a difficult time being absorbed into the body by itself, CurcuWIN increases the absorption of curcuminoids 46 times better than standard curcumin. This is further maximized with when combined with piperine, the key compound in black pepper. Our formula includes 10mg of BioPerine black pepper extract per serving to improve the bioavailability and benefits of curcumin. BioPerine has been clinically shown to increase absorption by up to 2000%, making BioSchwartz Turmeric Curcumin PM more effective than other formulas that do not contain clinically proven bioenhancers. Better absorption = better effectiveness, which means superior results for you. Our Turmeric Curcumin PM is formulated with SynergyFit Spice Blend: a specially developed combination of natural spices designed to work together to decrease joint pain while you sleep. This blend contains ginger and cinnamon, two spices incredibly important in pain relief. Ginger delivers dynamic anti-inflammatory effects while also reducing joint pain and muscle soreness. Cinnamon contains antioxidant and anti-inflammatory compounds that are excellent in fighting inflammation and pain. Studies have shown that cinnamon is also beneficial in improving cardiovascular health. When paired the other ingredients in our Turmeric Curcumin PM blend, they promote support for joints and influence high quality sleep, allowing you to wake up feeling refreshed and ready to take on the day. BioSchwartz Turmeric Curcumin PM is best paired with BioSchwartz Turmeric Curcumin with BioPerine to alleviate any joint pains you may have during the day. Using only the latest technologies, we are able to develop a turmeric with BioPerine that is 100% pure and natural with Non-GMO ingredients. Our pills do NOT contain fillers, binders, soy, gluten, milk, eggs, wheat, shellfish, preservatives or chemicals that most brands use today. When you buy BioSchwartz Turmeric PM with melatonin, you can be sure you are getting an ultra-pure turmeric curcumin powder. On top of our premium formulation, our turmeric pills are Gluten FREE, but also FREE of the most common allergens such as soy, milk, egg, shellfish, corn, wheat, peanuts and sugar. TESTED FOR HEAVY METALS. No other brand looks at quality quite the way we do. We devote the time and personnel to verify ingredient safety, and test for purity and quality at multiple steps, all to make sure our pure turmeric powder is tested for solvent residues, heavy metals, pesticides, and toxins. The result? We created a higher level of purity, safety, and quality for a superior turmeric product. PRODUCT SAFETY. While most companies only use 1 or 2 seals, our Turmeric Curcumin has 3 seals: an integrity and tamper proof seal to close the box, a pre-perforated neck-band and a heat-induction inner seal. Achieve better sleep today! SynergyFit is a unique blend of spices in BioSchwartz Turmeric Curcumin PM that work together to help maximize the health benefits of each other, promoting improved inflammation and better sleep for you. BioSchwartz Turmeric Curcumin PM is formulated with CurcuWIN and other beneficial key ingredients like Valerian Root, L-Theanine, and BioPerine black pepper. When combined, they exponentially increase the absorption of Curcumin in the body resulting in improved bioavailability and superior effectiveness for you. Every ingredient inside of BioSchwartz Turmeric Curcumin PM was carefully selected and combined to achieve maximum potency and efficiency. Our supplement is the result of unparalleled science, research and strict quality control standards that makes us stand apart from the competition. Combined with BioSchwartz Turmeric Curcumin 1500mg supplement, Turmeric Curcumin PM with Melatonin can provide restful sleep with continued joint support and flexibility.